If you are running an e-commerce business, we are quite sure that marketing - getting potential customers to your website, is on top of your agendas. How about fulfillment - processing orders and making sure that the orders reach your customers within (or exceed) their expectations? In fact, fulfillment is as important as marketing, yet being overlooked by many online merchants. We have seen businesses willing to invest marketing dollars, but clueless on how they can improve their fulfillment process. In this episode, let's understand the fulfillment process, and challenges arise in fulfillment, followed by recommended solutions to improve fulfillment efficiency. If you are new to e-commerce, you might think that "what's so difficult to fulfill the order?" 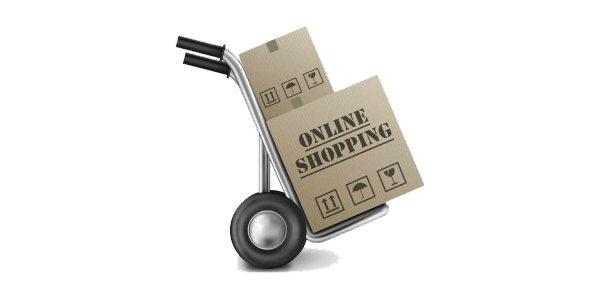 Some experienced online merchants have shared with us that selling online can be more difficult than selling offline. In most cases, the "difficult part" is fulfilling the orders. 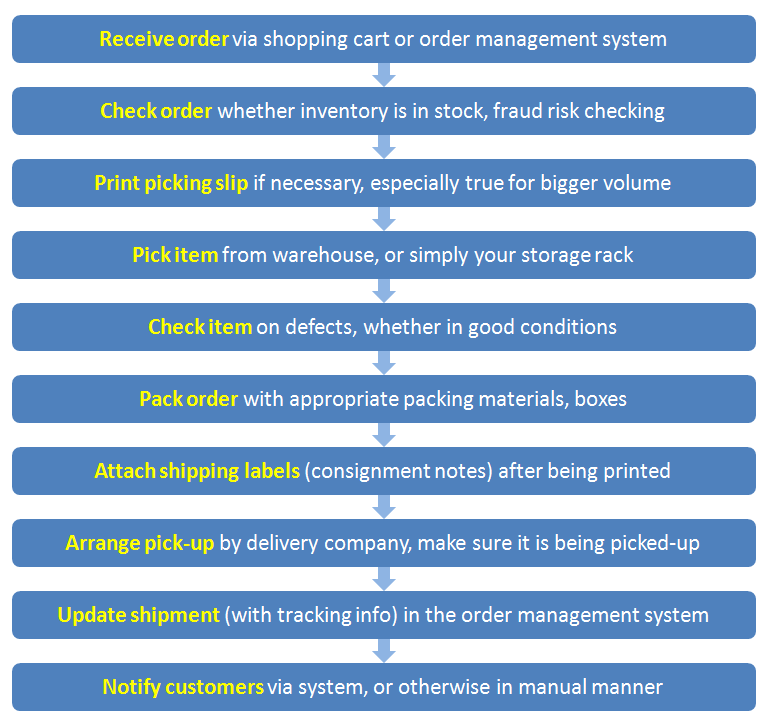 Fulfillment is sometimes mistaken for "only delivery" but in fact fulfillment generally involves 10 sub-processes, from checking, picking, packing to delivery, as illustrated below. Of course, it could be more complicated than the above but generally those are the processes that every online merchants need to execute. No doubt, the whole e-commerce fulfillment workflow is operation-intensive and error-prone. 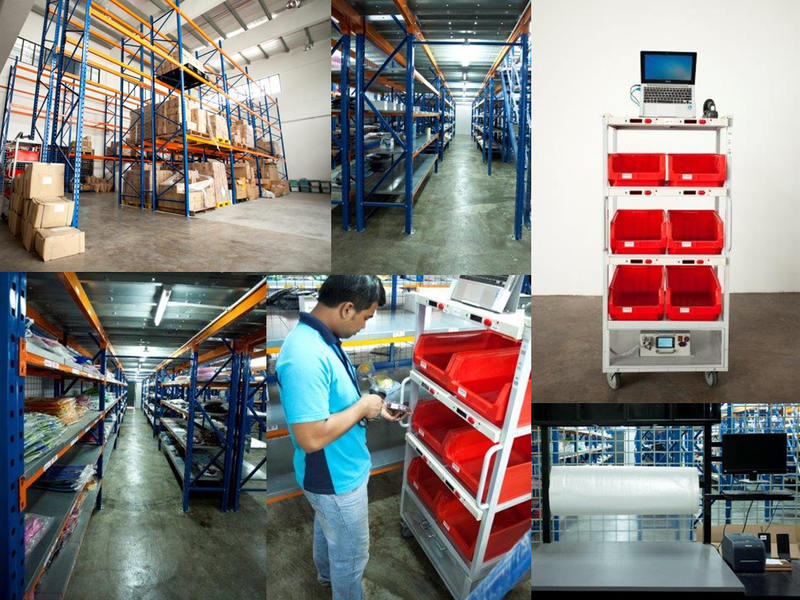 Errors typically occur during picking of the inventory, in which wrong products / SKUs are being picked up. The standard industry picking error rate is 1%, which means the chances are high that you could wrongly pick up 1 item out of 100 orders you are fulfilling. If your volume gets bigger, it can even affect your bottom line, not to mention unhappy customers. Another typical error happens during inventory management, particularly for smaller setups like blogshops. If the online merchants are not using any proper order management system, they need to manually update the inventory (probably in a worksheet) for every order fulfillment. 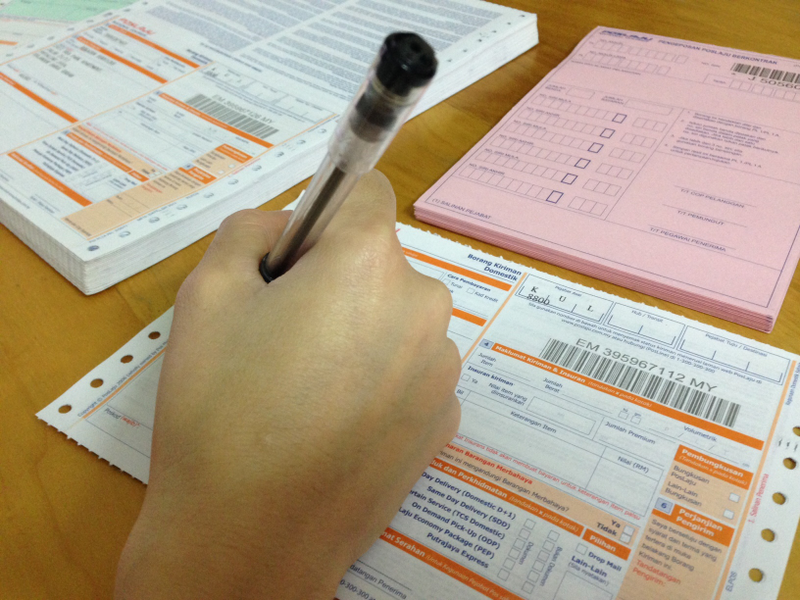 Errors aside, it is not easy to handle picking, packing, preparing consignment notes, and arranging shipment. This is especially true if you are doing it all by yourself, and try to think of a scenario that you need fulfill 50 or hundred of orders in a day. Although there is a printed alternative, you could imagine that writing 50 or more consignment notes in a day is not fun at all! So, what can you do in this situation? Does it worth adding a headcount to your business? How can you train or motivate him or her to minimize mistakes? What to do with him or her during off-peak season? Who handles the job if he or she is on leave? 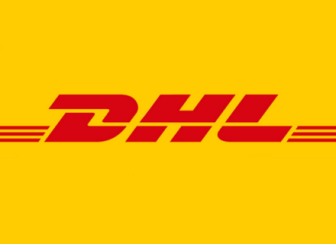 Have you ever considered outsourcing all your problems to a fulfillment partner? It is like hiring a reliable staff who handles your fulfillment professionally. 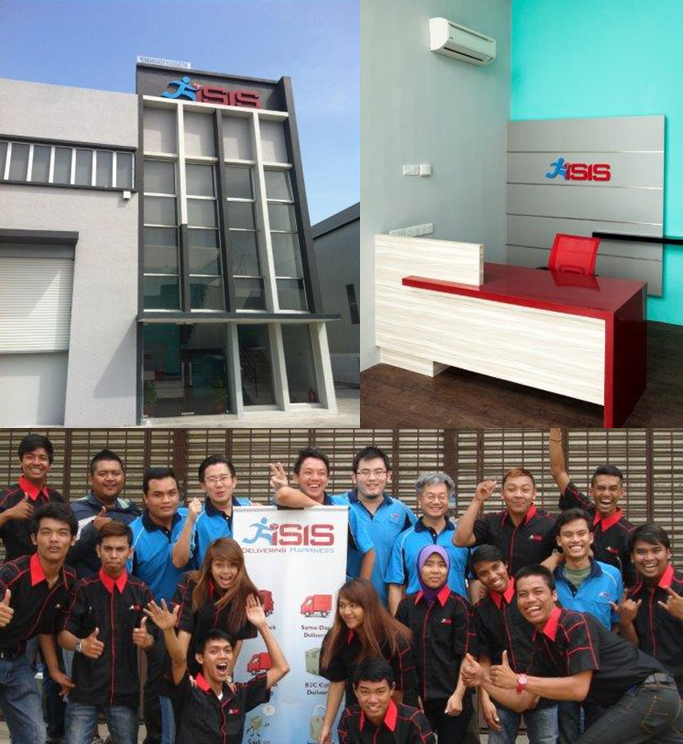 Sponsor: iSIS is Malaysia's first one-stop logistics solutions provider, handling from A to Zs from fulfillment services, warehousing, pick & pack services to regular delivery. Can you imagine that your whole fulfillment workflow will be handled by a storage and delivery partner like iSIS? Yes, everything from storage, picking, packing, shipping, plus handling returns too! Even return pick-up from the customers can be arranged. In short, it is just like "renting a pay-per-use warehouse" plus "hiring a delivery expert"! Most of the online merchants are not sure about the best available delivery option, as in which delivery service to use for specific weight, dimension and destination. In this case, iSIS will be able to choose the best delivery option for you, in terms of cost efficiency too. Besides that, whether you need to ship locally or cross-border, chilled or frozen delivery, cash on delivery, iSIS is the one-stop partner that solve all your delivery needs. Obviously, you can save a lot of hassles and minimize the errors working with fulfillment partner. However, opportunity cost is the real benefit of outsourcing your fulfillment workflow. As an online entrepreneur or business owner, ask yourself how much do you worth per hour? You should focus on growing your business instead of low-level operation. Furthermore, there is no upfront cost to "rent a warehouse" and "hire a delivery expert". Partnering with a fulfillment expert like iSIS is on pay-per-use basis, and most importantly scalable, which is perfect for your online business growth. Contact iSIS today on your fulfillment needs, plus FREE First Month Storage exclusively for ecommerce.milo readers!